Cozy Friedman is a stylist and the founder of Cozy's Cuts For Kids, a children's salon in New York City that first opened in 1994. She went on to launch her own hair product line, SoCozy Professional Hair Care for Children, and published a book, Cozy’s Complete Guide to Girls’ Hair. Cozy is one of the original NaturallyCurly columnists and a long-time curlfriend, and she has been generous enough to help our readers over the years with their most pressing questions about their kids' curls. My 15-month-old son is biracial and his hair is very curly but also very dry/brittle/frizzy. I'm not sure what my routine should look like or what child-safe products I should be using. From reading tonight, I do know I need to stop washing his hair so much and also get him a satin blanket for the crib and scarf for the car seat. Can you help? You are off to a great start already by just decreasing the frequency of shampooing! The next step will be to start using conditioner as much as possible. It can be tricky with a 15-month-old, because you obviously don't have unlimited time to condition and rinse after doing the same with shampoo. I recommend that you use a use a product that lets you do both at once, in order to maximize your time. Try So Cozy Cinch 3 in 1 Shampoo + Conditioner + Bodywash. In between wash days, while you aren't shampooing, be sure to use a leave-in conditioner. So Cozy Cinch Detangler + Leave-In Conditioner is great because it's a spray-in, so it's very easy to apply and it smells absolutely delicious, so your son will actually like it! My 2 1/2-year-old daughter is biracial. Her hair is pretty managable but since it has started growing it seem the hair on the crown will not define like the rest of the hair. It gets frizzy. I have added more leave-in but it still gets frizzy only on the top. Why is this? It's not unusual for toddlers to have more than one type of hair texture, as new hair is growing in. The key is to do what you are already doing—treat it differently than the rest of the hair. I would recommend using a little lightweight styling gel to help define and hold the curls. Be sure to use an alcohol-free gel such as So Cozy Boing Curl Gel-Cream so that hair does not get dried out. My daughter has got a ton of curly hair, and since she is only 3 years old, it is up to me to do her hair and I want to do it right. She is mixed, white/Hispanic, and I think she is a 3c, very tight, fine curls and lots of them. My problem is what do I do with her hair each day? It looks great after we wash it. I leave in conditioner and comb out the tangles and that's it. However, the next morning it is crazy and since we only wash it about once or twice a week she only has one good hair day. Now she is only 3 so she could care less but soon enough she will be all about her hair and I would like to know how to take care of it and how to keep the tangles out when she sleeps. Any suggestions are appreciated, especially since I have straight hair and am absolutely no help for her. I am learning as we go along! Thank you! It's fantastic that you don't over-wash her hair! That's the most common mistake I see with parents. In between shampoos and conditioning you will need to redefine the curls (remove the frizz). It's not complicated—you just really need to find the right product for her hair. My first thought is that a spray leave-in conditioner will do the trick, since you had good results from your conditioner. Spray So Cozy Cinch Detangler + Leave-In Conditioner throughout her hair, making it slightly damp and then "scrunch" curls with your hands to help redefine the curls and remove frizz. It really only takes a couple minutes and it will be easy for your daughter to do herself when she's a little older. I am the mother of a beautiful 8 1/2-year-old who will only wear a ponytail. She has 3b hair underneath and most of her hair around the top from the middle of the head up is probably 3c and fuzz. Two years ago I had her hair relaxed and only touched up once. She only has about one inch of straight left on the ends. Mostly her hair just turned back curly as the relaxer didn't seem permanent in places. It was a Mizani relaxer done at a salon. Her hair has changed. I used to be able to let her wear some curls but now it is just pure fuzz. I have used all sorts of products—none of them seem to last on her hair. I really want to know about braids. I don't have experience with them being a redhead with board straight hair. I had an African American woman tell me once to never never braid my daughter's hair. She said it will pull it out and make sores on her head. I can french braid but she has breakage from wearing it all these years in one ponytail that it never stays put. I have often pulled it up it two high ponytails on her head then turned each ponytail into two braids, French braided it and various other things and the moment she hits school, she takes it down and puts it into one ponytail. Any suggestions? Types of braids or products people can't live without? Right now we use Mizani shampoo, Neutrogena Triple Moisture Deep Conditioner and plain old shea butter. I have used Mixed Chicks, Carol's Daughter, Paul Mitchell and the list goes on. The way I see it, you have two issues. First, you are definitely in the "in-between" stage where you really need to let her hair grow out and get rid of the damaged hair caused by the chemicals in the relaxer. Unfortunately, there's no way around it. Time and using a great, thick creamy conditioner will help. The other issue as I see it is that you and your daughter need to be more in agreement. If you are doing her hair and then she is re-doing it when she gets to school, it doesn't do either of you any good (and it's not great for her hair either). There comes a time when you have to let children be themselves and wear their hair the way that makes them feel comfortable and good about themselves. I cannot begin to tell you how often I see this issue in my salons and it happens at all different ages depending on the child. I'm not recommending that you give up and just let her wear the pony, but maybe if you can find out what it is about the pony that makes her feel so comfortable, you will be able to use that information to figure out and work with her on another style that you will both be happy. Look at magazines and on the web to find style ideas. Lastly, braids are fine as long as she doesn't only wear it braided and you don't pull them too tight. 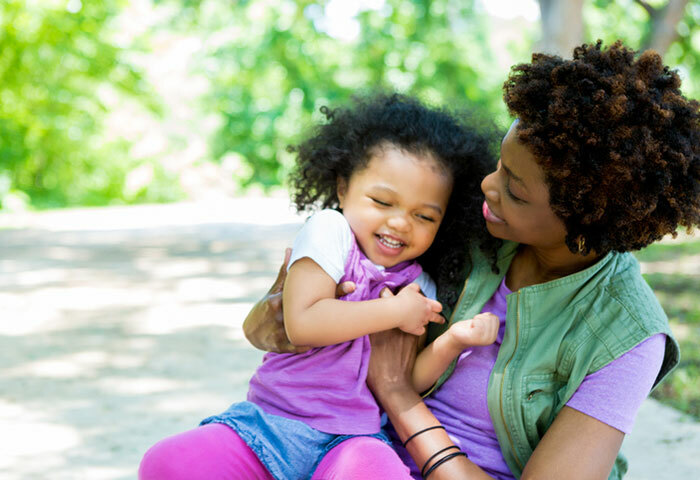 What's your biggest concern when caring for your kiddos' curls? This article was originally published in 2010 and was updated in 2018 to reflect new recommendations.